Thanks for letting me advertise the blog. 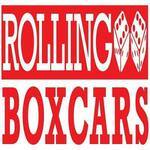 Rolling Boxcars is a gaming blog (80% RPGs); we have a tendency to write and review two or more products each month. We also write and publish a variety of editorials and advice articles each month. Come on over and see what we're about.